Total number of users - Total number of users of your bot till date. Total number of sessions- Total number of sessions of your bot till date. Total number of AI messages- Total number of AI messages to your bot. Total Messages- Total number of messages the bot received. Here in every box, you will see 8 small icons, let us understand in detail how they work. Calendar- It helps to set the date of the data you wish to see. SVG- You will be able to download the data in SVG format. Select- You can select a particular section from the screen. Zoom in- As you zoom in you will get more and more specific data. Zoom out – Zoom out will help you to move out from the zoom in screen. Panning- This button helps to slide the data that you have zoomed. This button can only be used after selecting zoom in option. Reset zoom- As you click on reset zoom the data will be back to its standard format. Here the chatbot shows you the number of active users on a weekly, monthly and daily basis. Weekly basis is the number of active users from the previous week to the date selected by you. For example, 21st August shows weekly user as 230. These are the number of users from 14th August to 21st August. A week before the selected date. Monthly basis is the number of users in the complete month. 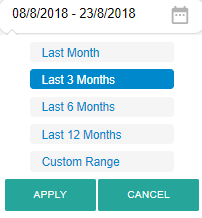 Continuing the example date selected is 21st August so the number of users in the month of August. Daily basis is the number of users in that particular day. 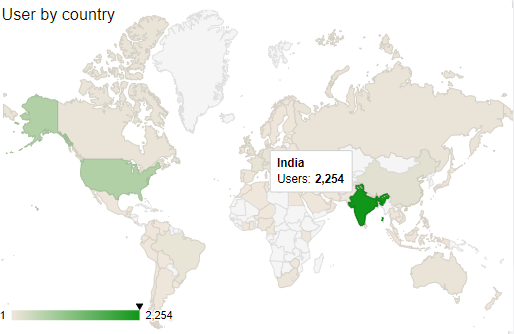 The bot shows a geographical image of the total number of users from a particular country. The darkest color denotes the highest number of chatbot users and the lightest show the lowest number. 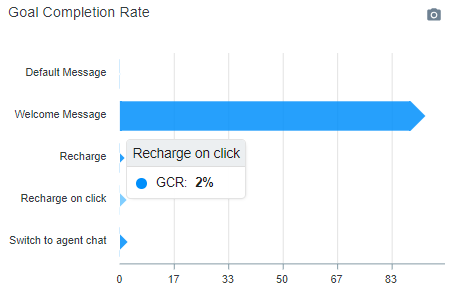 Cohort Analysis gives you data regarding the number of times a user came back to the chatbot. 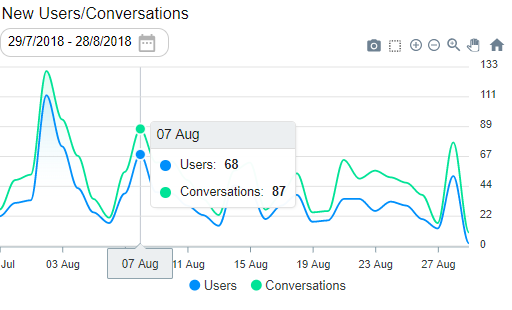 Here the bot shows the number of new users and new conversations in the last 7 days. You can filter data by selecting the date from the top left. 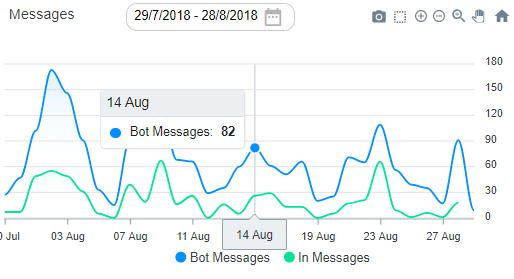 Bot statistics gives a detailed statistics of your bot like messages, average response, fall back rate and much more. 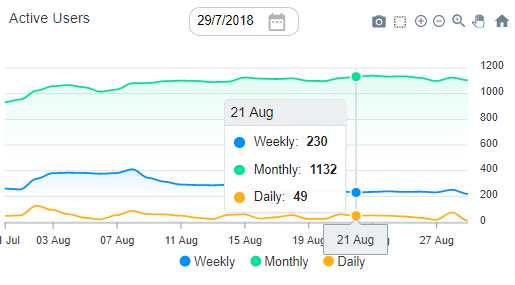 You can select a date range from the top of the graphs and it will show data accordingly. 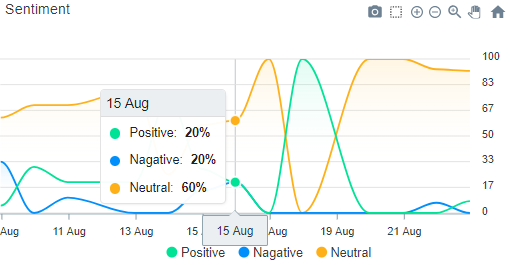 The date selection will change the data of sentiment and fall back rate. Sentiment analysis displays user sentiment. The data allows you to understand the user experience based on the response received by the chatbot. The sentiments are categorize as Positive, Negative and Neutral. 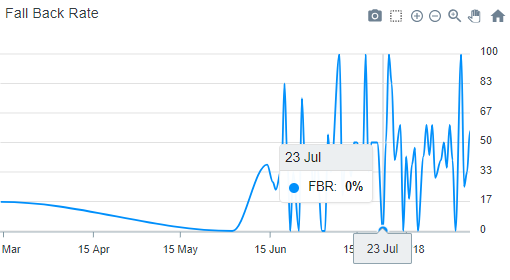 Fall back rate is a percentage of time the bot was not able to answer queries. 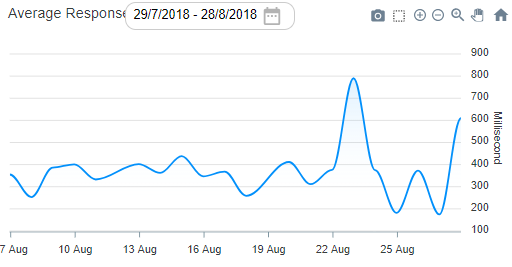 This graph shows you the number of messages the bot received and the number of messages the bot triggered. This shows you the average time taken by the bot to answer a query. The time is recorded in milliseconds. Goal completion rate shows you a list of flows which your users visited. The percentage determines if the flow that was triggered was completed or not. For example here the percentage is shown is 2% it means that particular flow was started but it was not completed.